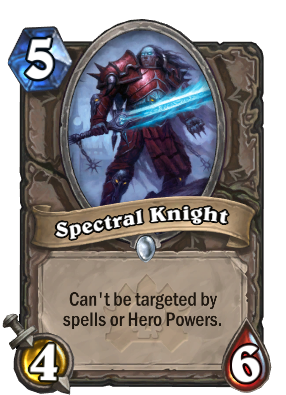 Spectral Knight was added in the Curse of Naxxramas Adventure. He is available from Wing 3 - The Military Quarter which opened on August 5th, 2014, and is obtained after defeating the adventure boss Gothik the Harvester. Need help conquering the Curse of Naxxramas Adventure to obtain Spectral Knight? Head on over to our Curse of Naxxramas Adventure Guide! This is perhaps the solidest 5 drop in the game until the date. Oh look, it's one of the most over-hyped Naxx cards! There aren't many practicle methods to make a clean trade with it. Not for long, given that the upcoming Shrinkmeister + Cabal Shadow Priest combo will allow you to steal any 4 attack minion of your choosing. Also druids can silence it with Keeper of the Grove. But if you do that, it's almost always a 3 for 1 to get rid of him still. Coming soon to a midrange deck near you. That's also assuming a Turn 1 Coin + Wild Growth. Or a Turn 2 Coin + Innervate. It's really no more GG than a Yeti. It's definitely more of a GG than a yeti. The only way to actually get rid of a turn 2 yeti is with spells, which don't affect this guy. It's stronger aye, and it's a good card, I like it, but it's harder to get on the field than the Yeti is. It's basically any creature effect can hit them, just not direct target spells or hero powers.